A probably fake, albeit hilarious new report has emerged that Harry Styles dumped Taylor Swift because she's "asexual" and "constantly talked about antiques." A rather Regina George-y sounding friend of Taylor's says that America's Unicorn Sweetheart doesn't realize that she's constantly being dumped because she's a "prude" who "doesn't put out." 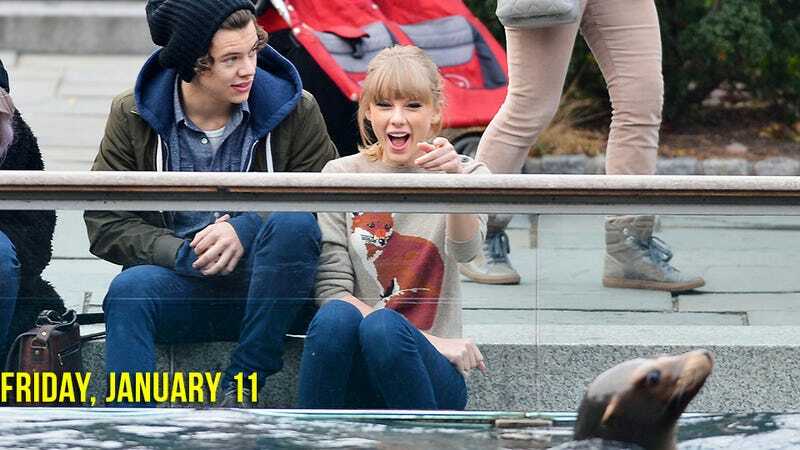 "While it was clear she obviously had a thing for Harry, Taylor didn't want to put out as often as he would've liked. Harry is a young boy, with ladies throwing themselves at him and has had a string of relationships with older women. It's no secret he's sexually active and is enjoying his fame at the moment. But Taylor just wasn't up for it as much as he is. They were sexually incompatible." I love your bracelet, where did you get it?! The source adds that a clean and wholesome reputation is very important to Taylor, and Harry found her "a little sexually uninterested" for his taste: "Harry wants to go out to fancy bars and clubs and enjoy being young – but Taylor's more of a homebody and all she would talk about was antiques!" Last year, Kelly Osbourne was discussing being fat-shamed in an interview and, rather surprisingly, asserted that Lady Gaga's fans were "the worst" ("They've said I should kill myself, that they hope I get raped"). She added that Gaga had a responsibility to try to "stop" the Little Monsters' negative behavior. I have empathy for you Kelly, but I feel it culturally important to note that you have chosen a less compassionate path. Your work on E! with the Fashion Police is rooted in criticism, judgment, and rating people's beauty against one another. "Appearance" is the most used reason for bullying in the world. Your show breeds negativity, and over the years has even become comedic in nature. It glorifies you and Joan Rivers pointing in the camera, laughing, and making jokes about artists and celebrities as if we are zoo animals. You say her work on E! with the Fashion Police is "rooted in criticism, judgment, and rating people's beauty against one another." Welcome to the real world. Example, when I saw you wear a dress made out of raw meat, I was sickened. When I see you wearing fur, and using it as a fashion statement, the fact that defenseless animals have been killed so you can get your picture in the press is abhorrent to me. Shouldn't you be teaching your "little monster" fans to respect animals and life? I don't feel I have to justify Kelly's choices in life to you. By your actions to Kelly right now, you have shown me that you are nothing more than a publicly seeking hypocrite and an attention seeker. If you, like I, are a subscriber to Gwyneth Paltrow's newsletter/oeuvre GOOP, you snarfed yesterday when you read: "Happy 2013! I am not on a detox. I am not on a diet. I know, New Year's cleansing and all that. Not this year. Can't do it. Maybe later in the year. Maybe in the spring. So for now, I would like to continue with my pasta and cheese, but perhaps be more mindful of ingredients." "virtually every existing photograph of her, starting with the very first frames taken of Destiny's Child, the '90s girl group she once fronted; every interview she's ever done; every video of every show she's ever performed; every diary entry she's ever recorded while looking into the unblinking eye of her laptop."